Patrick Robinson is an American football cornerback for the New Orleans Saints of the National Football League. 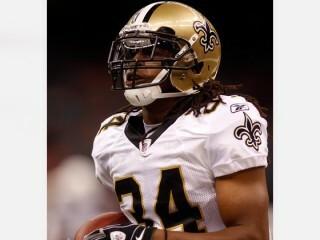 He was drafted by the Saints in the first round of the 2010 NFL Draft. He played college football at Florida State. Coming to Florida State as a 169-pound freshman, Robinson matured both on and off the field. His added bulk, along with his excellent speed, has often seen him emerge victorious when taking on the opponent’s premier wide receiver. Few cornerbacks have the natural hands and ball skills Robinson displayed in his career. He can go up and compete for the ball at its highest point with the best receivers in the game. Robinson is capable in run support as well and took on a more active role inside the box in 2009. Twenty-four of his career-high 52 tackles came vs. the running game in 2009. Attacking the ball like a receiver is how Robinson intercepted six passes in 2007 to earn honorable mention All-ACC recognition. The cornerback burst onto the scene as a sophomore, intercepting six passes while starting five games to tie for seventh on the school’s season-record list. He also tied a school record by picking off a pass in five straight games. In 2008, Robinson notched 26 tackles, four passes defensed and one interception. He capped off his career in 2009 by earning second-team All-ACC honors as a senior while helping Florida State to a victory over West Virginia in the 2010 Gator Bowl. He provided a lasting memory of his outstanding speed in that contest by chasing down blazing fast West Virginia running back Noel Divine on a 70-yard run. Robinson attended South Miami High School before transferring to Gulliver Prep. As a junior, he was an All-Region selection by Prep Star, as he caught 32 passes for 491 yards and six touchdowns offensively and added eight interceptions as a defensive back. Robinson scored 10 touchdowns and intercepted 11 passes as a senior to earn first-team All-State honors for Class 2A from the Florida Sports Writers Association. Scout.com and Rivals.com gave the cornerback a four-star rating as both recruiting services listed him as the 16th best prospect at his position nationally. Robinson chose Florida State, enrolling in 2006. He played in 12 of the team’s 13 games as a back-up to Tony Carter at left cornerback. The first-year freshman made an impact on the Seminoles’ special teams unit. In the Clemson clash, Robinson blocked a PAT attempt that was returned for a defensive score, marking the first time in school history the feat had been accomplished. He later returned a blocked PAT the length of the field for a defensive score in the Seminoles’ victory over Duke. In his second season, Robinson exploded onto the scene, playing in 12 games and starting five contests at the boundary cornerback position while splitting time with Michael Ray Garvin. He led the team with six interceptions and tied a school record by picking off a pass in five consecutive games. He averaged 0.5 interceptions per game to rank third in the ACC and 12th nationally. His six pass deflections were also tops among Seminoles defenders. He started eight of the nine games he played in 2009. He racked up 26 tackles (22 solo) with two stops for loss of six yards while deflecting four passes and intercepting another. As a senior in 2009, Robinson started all 12 games he played in, missing the Georgia Tech contest with a sprained left ankle, and earned second-team All-ACC honors. The senior cornerback ranked fifth on the team with 52 tackles (16 solo), including three stops for losses of seven yards. He tied for seventh in the ACC with an average of 0.92 passes defended per game, as he totaled a career-high 11 pass deflections. In 45 games at FSU, Robinson started 25 contests at the right cornerback spot, collecting 117 tackles (82 solos), including seven stops for losses of 21 yards…He deflected 21 passes and intercepted seven others for 87 yards in returns…His six INTs in 2007 tied six players for seventh on Florida State’s single-season record chart…Intercepted passes in five straight games in 2007 to tie a school record…Also forced two fumbles and blocked a PAT that was returned for a defensive score vs. Clemson, marking the first time in school history the feat had been accomplished…Returned one blocked PAT for another defensive score vs. Duke in 2006…On special teams, Robinson returned 15 kickoffs for 330 yards (22.00 avg). Second-team All-ACC selection by the Atlantic Coast Sports Media Association…Team’s Hinesman Award winner as the most dominant player this past spring…Team Defensive MVP...Started 12 games at boundary cornerback…Fifth on the team with a career-high 52 tackles (36 solos) with three stops for losses of seven yards…Tied for seventh in the ACC with an average of 0.92 passes defended per game, as he led the team with a career-high 11 pass deflections, including three in third-down attempts…Forced two fumbles…Made 33 stops after receptions for 414 yards (12.55 avg), five touchdowns and 17 first downs, as he made 13 third-down stops and another on fourth-down vs. the aerial game…Rerouted receivers away from 16 pass attempts…On 24 running plays, the opposition gained 241 yards (10.04 avg) and six first downs against Robinson, including two third-down stops…Returned 11 kickoffs for 218 yards (19.82 avg). Starter at the boundary corner position in eight of nine games he appeared in, as Robinson posted 26 tackles (22 solos) with two stops for losses of 6 yards and a forced fumble…Deflected four passes and intercepted another, as FSU ranked sixth in the nation and led the ACC in pass defense (162.38 ypg)…Gained 112 yards on four kickoff returns (28.0 avg). Earned All-ACC honorable mention from the Atlantic Coast Sports Media Association and named second-team by Rivals…Member of the Miami Herald All-Florida team...Played in 12 games while starting five contests at the right (boundary) cornerback position...Earned a team and career-high six interceptions, including one each in five consecutive games to tie the school record for consecutive games with at least one interception, totaling 87 yards, as he also deflected six passes…His interceptions ranked third in the ACC and tied for 12th in the nation…Recorded 28 tackles (18 solos) with a stop for a 3-yard loss and a forced fumble. Played in 12 of 13 games at the field corner position...Recorded 11 tackles (6 solos) with a stop for a 5-yard loss and gained 16 yards on a blocked punt return. Attended South Miami High School before transferring to Gulliver Preparatory (Miami, Fla.)…Starred in football and track and field, finishing third in the state champions in the 100 and 200 meter sprints during his senior season…As a junior on the gridiron, Robinson was an all-region selection by Prep Star magazine while recording 32 catches for 491 yards and six touchdowns offensively, adding eight interceptions on defense…He was named first-team All-State for Class 2A by the Florida Sports Writers Association after intercepting 11 passes on defense and scoring 10 touchdowns on offense as a senior…Represented Team Florida in the annual Cali-Florida Bowl and was named to Rivals.com’s Florida Hot 11 list after his performance in the event’s practices and game…He was given a four-star rating by Scout.com as that recruiting service listed him as the nation’s 16th best corner-back prospect…Given a four-star rating by Rivals.com, who listed him as the nation’s 16th best cornerback prospect and the 37th best recruit from Florida. View the full website biography of Patrick Robinson.